How to make tartar sauce? Tartar sauce contains slight amount of vitamins and fat and can be great to serve with seafood dishes. It is a mayonnaise-based sauce. The easy part about preparing the sauce is that there is no cooking required and only a few ingredients is necessary. Tartare sauce is that tangy paste present in chips and extravagant sea-food eateries. It originates from the desolate prairielands of the olden Tatar people. Nowadays, it is used for mostly fish and chips. 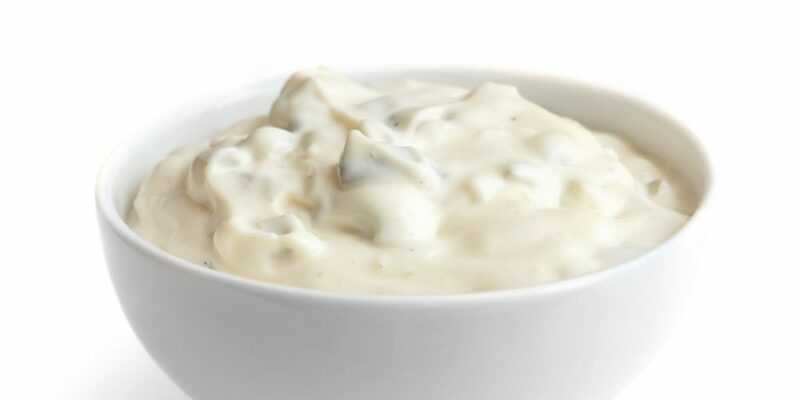 Here is how to make tartar sauce. Step 1: Start with squeezing a small lemon in the bowl you are going to make the sauce. It can be a glass bowl or a plastic one. Have a wooden spoon for mixing or a regular fork. Getting the juice out of the lemon is the first step because some lemons have seeds in them and when the seeds fall into the bowl, take them out with the fork. You can utilize a simple hand press for making lemon juice. If you do not have that, squeeze with hand. Step 2: Get 3 tablespoons of mayonnaise. You can pick out any mayonnaise from the store just make sure it is fresh. You can even use homemade mayonnaise. In order to make the mayonnaise, mix egg yolks, a small amount of white vinegar, 1 tablespoon of English mustard, 2 cups of vegetable oil and whisk them till you have your mayonnaise. It is better to have a store-bought mayonnaise so that it saves your time. Step 3: Add the dill pickle relish on the mayonnaise. Mix them with a spoon or a fork. Chop of the onion in very small pieces and add it to the mixture along with the capers. Do not eat it instantly. Keep it in the refrigerator for an hour before serving. You can add freshly ground pepper to the sauce. If you do not have capers, use green olives. If you do not have all the ingredients, three of the basic ones are sufficient in preparation of this sauce. They are a cup of mayonnaise, one tablespoon fresh lemon juice and 5 tablespoons sweet pickle relish. Mix them together and refrigerate for the tartar sauce you are looking for. • The one hour of refrigeration is required for that perfect flavor. Many people make the tartar sauce with high-quality ingredients and still they complain that the taste is bland. It is because they did not let the ingredients mix. • You can keep it in the refrigerator for up to five to seven days. • You can mix all the ingredients with a whisk instead of using a spoon or a fork. This entry was posted in Food on September 28, 2017 by Tom.